When you do it right, it can actually be a full body workout. A movement that targets just about every muscle group in your body. This makes it one of the most efficient and effective exercises a person can perform. Whether you have 5 minutes or 45 minutes a day, doing squats over a period of several weeks or months is bound to pay off. So, the question then becomes: what is the right way to do a squat? Unlike eating Reese’s peanut butter cups (which we strongly advise against), there is a wrong way and a right way. And we’re going to teach you the latter. But first, we should clarify a few things, like why is it important to do squats in the first place? The short answer is, as stated above, it’s extremely effective. Whether you’re trying to lose weight, build muscle, or both, the squat can help you accomplish your chiropractic fitness goals fast. It’s one of the most basic foundational moves in any fitness routine. We’ve been doing squats since we came out of the womb. Over time, as we began sitting in the same position all day long, our squat form became basically nonexistent. 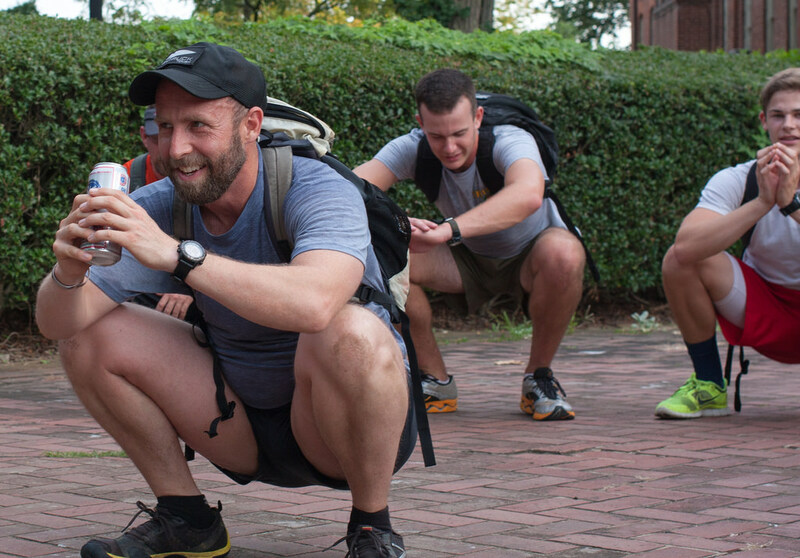 Many of us don’t know how to properly do a squat at all. It doesn’t leave anything out. You don’t just use your legs to squat. You use your hips, core, back, and even your shoulders and arms for balance. This compound movement is a challenge for multiple muscle groups, giving you a total body workout with fast results. Squatting will make you a better athlete. Whether you’re running a marathon or giving birth, this movement builds strength in areas that many people would call “weak,” including your knees and hips. This makes you stronger which leads to better athleticism overall. This is a critical training move if you play any type of competitive sport. In short, with squats, you’ll get the biggest bang for your buck. It’s no surprise why this exercise is in just about every chiropractic fitness routine, and most experts would recommend you perform at least 2-3 times per week. So let’s get to the goods … how do you make the most out of this incredible movement? Stand with your feet slightly wider than hips-width and your toes pointing slightly outward (~5 to 20 degrees). Keep your head up and look straight out in front of you at a spot on the wall. Keep your head and gaze in this position throughout the exercise. Put your hands around chest-height with your elbows bent as though you’re holding an imaginary medicine ball. Tighten your abs and keep your core engaged throughout the movement. While breathing in and bending your knees, send your hips backward as though sitting in a chair. Keeping your back straight, your chest and shoulders up, and your spine in a neutral position, be sure your knees stay in line with your feet and don’t move past your toes. Continue to squat until your hip joint is lower than your knees. Keep your core engaged and everything tight, and drive through your heels to return to a standing position. Make sure the balls of your feet stay firmly planted and squeeze your glutes at the top. Once you master your bodyweight squat technique, you may want to try adding a little extra weight to the movement by trading that imaginary medicine ball for a real one! But concentrate on mastering this exercise with just your bodyweight for now. Any chiropractic fitness expert will tell you that proper technique is crucial to getting the results you want in a least amount of time. If you’d like to know for sure that you’re doing the squat properly, give us a call to schedule an office consultation! We’ll include a mini-lesson on squatting along with an X-ray, any necessary diagnostic testing, and your first adjustment for just $50! Still not sure if chiropractic fitness is right for you? Click here to request a free phone consultation, and one of our doctors will call you to discuss your goals and needs.